Even Israeli occupation officials question the amount of secrecy afforded to the Ministry of Strategic Affairs’ anti-BDS campaign. Yossi Melman details in his recent article [link: Hebrew] in Maariv newspaper what little is known about the Israeli government’s efforts to undermine the Boycott Divestment and Sanctions movement (BDS) through the Ministry of Strategic Affairs (MoSA). Even the Israeli ministry of justice – a crucial arm of Israeli occupation – fears that the almost complete secrecy afforded to the MoSA could result in unchecked “adventurous operations” against BDS activists. According to Melman, the MoSA was established in 2006 to honor (and employ) Avigdor Lieberman. Initially it was unclear what the strategic affairs ministry would actually do: it had only seven staffers and a small budget. 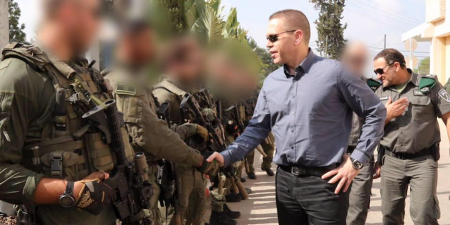 But, today, under Gilad Erdan’s leadership, the MoSA enjoys 128 million shekels to combat the BDS movement and “delegitimization,” as well as “Palestinian incitement.” Another 44 million shekels account for operating expenses and the salary of 25 anonymous employees. Erdan recently enlisted the former head of military censorship, Brigadier General Sima Vaknin-Gil, as the director of the MoSA; she has emerged as an impassioned advocate for the ministry’s ongoing secrecy. “If you want to successfully conduct a battle, you need to do it with a lot of secrecy” she added. Ram Ben-Barak, the former deputy head of the Mossad spy agency and a firm believer that BDS should be considered terrorism, designed the structure of the MoSA. The ministry is divided into three parts: intelligence, awareness (media) and operations. The names of MoSA’s department heads have not been published, as per the ministry’s request, although it is known that a former investigator for the Israeli security agency leads the intelligence unit. The MoSA primarily collects data on BDS from public sources, according to Melman. But, the intelligence community collaborates with MoSA and offers it covert intelligence too. Doing so likely requires little extra effort, considering there is already a unit focused on combating BDS in the Israeli intelligence corps and security agency. In addition to its intelligence activities, the MoSA’s awareness department has started to finance visits to Israel for “opinion shapers” – i.e. newspapers, bloggers, actors, trade union leaders, etc. The aim of these tours is to craft visitors’ perception of Israel as a democratic state. Another known anti-BDS initiative from the MoSA involves lobbying companies to not boycott Israel. This effort seeks partnerships with Jewish and pro-Israeli organizations in the U.S, such as AIPAC and the Jewish student movement Hillel, as well as their counterparts in other countries. Melman, however, locates MoSA’s most serious threat not in its “awareness” or even “intelligence” departments, but in its operations unit. As the MoSA’s anti-BDS efforts expand with the government’s tacit approval, an inter-ministerial committee, which includes representatives from the justice ministry, ostensibly plays catch up: the occupation’s legal definition of what counts as “delegitimization” and what kinds of BDS activism warrant punishment is still in the works. I’m going [to London] to battle the boycott and delegitimization in every arena, and to discuss with members of the British government – which is also committed to fighting boycotts – ways to strengthen our cooperation against the anti-Semitic boycott campaign… I will meet with government officials and law enforcement in order to form a front of democratic countries against the worldwide threat, which includes targeted action against incitement on the Internet. Sergio Yahni is a veteran activist in anti-Zionist movements and the Media Director of alternativenews.org.